These are just my observations when using the Dell Visor. The headset is well designed and in my opinion is the best looking of the Microsoft Mixed Reality headsets. When you pick it up it also feels a quality item. The build quality and materials used are comparable to the Playstation Virtual Reality headset. It also has a similar adjustable headband which tightens using a thumbscrew. I find the headset to be more comfortable than the HTC vive. The headband design is superior than the strap solution. It’s also easier take on and off. As well as being easy to wear and remove the Dell Visor flips ups like a welding mask. This is very handy when developing in Unity as you can type, publish and then flip down and see the results. Also when gaming it’s useful for spotting where the keyboard is or where you left that drink and so on. I have the Dell Visor plugged into a 1060 GTX which in turn is plugged into an AMD 8350 with 32GB of RAM. I have had no issues so far with frames being dropped. I have used it with Project Cars, Super Hot VR, Rez and Thumper. I’m also using it while developing within Unity. You will need to buy a bluetooth 4. I purchased the Plugable USB-BT4LE USB Bluetooth 4.0 Low Energy Micro Adapter . It works very well with the VR controllers. How does it compare to the HTC vive and Oculus Rift? Having used all three I can say well. The main difference between the mixed reality headset is the IPD adjustment. The HTC Vive and Oculus is hardware based. The mixed reality head sets have software adjustment. I had to adjust my headset’s IPD value. The IPD value or Inter-Pupillary Distance to give it it’s full name is the distance between you pupils. I measured mine with a set of digital calipers you could use a ruler or next time you are at the opticians ask for the value or your IPD. If the image appears fluffy you may need to adjust the value. You can find details on how to adjust the IPD value and troubleshoot and mixed reality problems here. 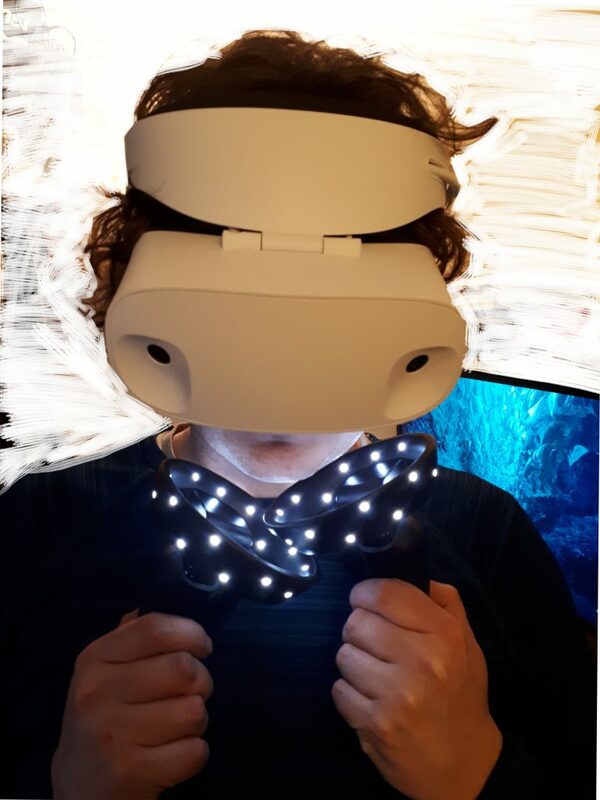 If you develop content for VR the mixed reality headset is a big step forward. The inside out tracking dispenses with the extra sensors required by the HTV vive (Lighthouses) and Oculus Rift sensor camera. This leaves allot more of your precious USB ports and power sockets free. It also opens up the possibility of developing on a laptop and on the move rather than being tied to an chunky desktop you have to drag around with you. Imagine the scenario. You have developed some content and you want to show it to someone without a VR setup maybe a client you are trying to pitch to. They do not have a VR capable rig. So you pack up your desktop into a box as best you can and call the courier and then catch your flight while hoping nothing is damaged in transit and you haven’t forgotten the mass of cables and power supplies you need. You also hope there is space where you are going to demo it. Fingers crossed! Alternatively with the windows mixed reality setup just turn up with your laptop plug in the headset using 1 HDMI and 1 USB port run the setup and you are pretty much good to go. The simplicity of the Microsoft solution will allow many more people to experience virtual reality who don’t have a huge amount space and time or inclination to setup a room just for VR. Yes Steam is available on a Windows Mixed Reality and it all works well. I am not the biggest gamer in the world but VR has definitely got me gaming more. I love Project Cars, on the Dell Visor it’s very good. I will be ordering Project Cars 2 soon. Super Hot VR is epic, it’s a piece of art and a big step forward in the first person shooter genre. Next Next post: So what is it i do?